The School of Engineering is creating a new strategic plan that will shape the direction the school takes over the next five years after appointing Reginald DesRoches as the new dean of engineering this year. According to DesRoches, a draft for the new strategic plan is projected to be completed by the end of 2017, and the final plan will be completed in the spring. The last strategic plan was developed six years ago with the appointment of DesRoches’ predecessor. According to Bart Sinclair, a senior associate dean in the engineering school, the growth in the number of students is a major aspect to be accounted for in the plan. The plan is still in its formative stages, with most of the efforts directed toward soliciting feedback from students and staff. Last month, students, staff, faculty and alumni of the engineering school received an email link to a survey asking for their input on the strengths and weaknesses of the school. 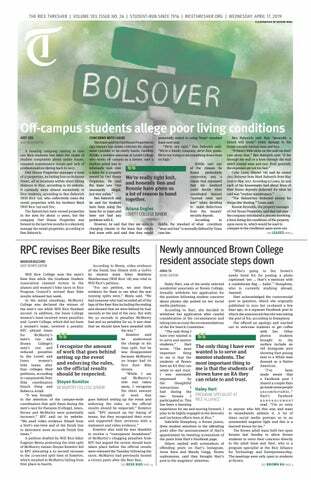 Gigi Rill, a student representative for Rice’s chapter of the American Society of Mechanical Engineers, said that she is impressed by improvements in the mechanical engineering department since the department’s town hall in November 2016, but still sees area for improvement. The town hall was initiated to address student frustrations over the lack of funding, a shortage in tenured professors, and under-resourced labs, as the Thresher previously reported. “[Mechanical engineering] students especially feel that there aren’t a lot of options being brought to campus for careers other than oil and gas,” Rill said. Emily Braverman, a computer science major, said the size of the department poses a challenge. Braverman also said she hopes the administration will incorporate student wellness into their plan, citing a conversation she had with a professor in the computer science department over two exams scheduled for the same day. Angela Zhang, a bioengineering major, said she hopes for more collaboration between engineering majors in the future, citing this year’s lack of interdisciplinary teams in senior design, the capstone course for all engineering majors. Zhang also said that the school should introduce a required engineering design course for freshmen. “This would help students know if they really want to do engineering or not and get an idea of what various engineering disciplines are before they’ve essentially committed to a major during their sophomore year,” Zhang said.